Custom T-shirt Printing, Direct to Garment, Silk Screen Printing, Embroidery, Airbrushing, Iron-on Letters & Numbers, Heat Photo Transfers, Graphic Design Services, and Events. We specialize in full color, Direct to Garment (DTG) printing as well as embroidery and airbrushing. We also offer screen printing for larger orders. We do more than custom T-shirts. We customize anything that can be airbrushed, embroidered, or heat pressed with Iron-on transfers or Iron on Letters and numbers. In addition to custom shirts we do hats, shoes, blankets, wedding dresses (it has happened), towels and all Promotional Products. Igor’s T-shirts also offers graphic design and mobile airbrushing at parties and events, on-site parties and educational programs for kids. Don’t know which method of T-shirt printing or embroidery is best for your project? Call us at 303-750-7281 or email igorstshirts@gmail.com. We will help you make the best decision, even if we don’t offer what you need. 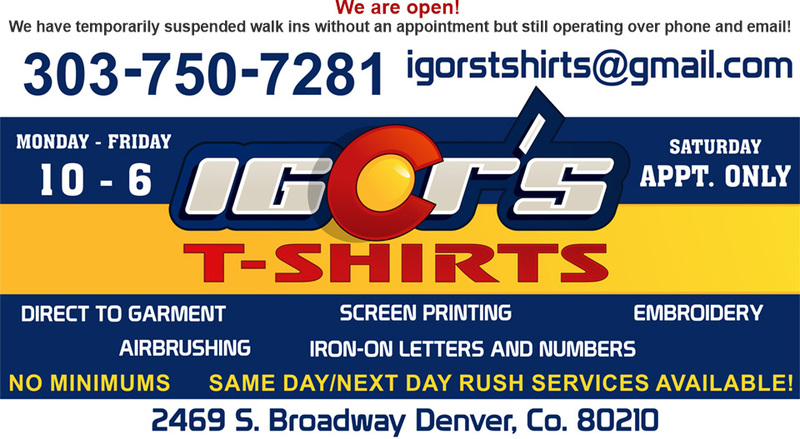 Igor’s T-shirts has been designing and making custom printed t-shirts and apparel for Denver, Aurora, Colorado, U.S. and international customers since 1995.